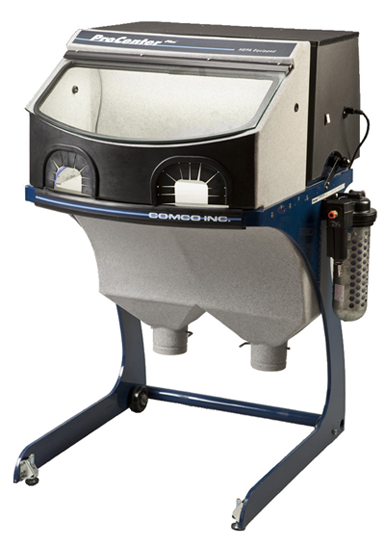 A clean environment with a clear visual field is essential for accurately blasting small parts. Effective removal of fine micro-abrasives from the WorkStation requires more than a simple shop vacuum. Only an industrial-grade dust collection system can keep a blast environment clean. 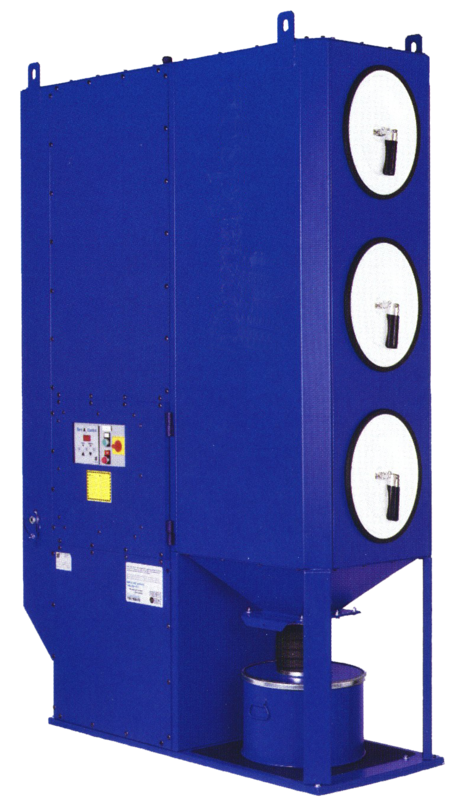 Comco’s dust collectors provide positive airflow through the work chamber to efficiently extract spent abrasive and a HEPA filtration is available on all Comco dust collectors. Comco’s newest dust collector is also the most popular. The majority of applications benefit from this all-in-one system. The ProCenter Plus™ combines a compact dust collector and chair-height work chamber in one freestanding unit. Its curved floor, air jets and HEPA filtration all work together to provide a clean work environment during multi-shift blasting without the need for frequent maintenance. The DC3100 is designed for heavy production use. Its self-cleaning cartridge filters and accessible discharge pail make the DC3100 the ideal dust collector to keep multiple systems running efficiently. Pulse jet operations keeps the DC3100′s cartridges clean. Periodically a jet of air pulses each of the filters, dislodging abrasive as it accumulates on a cartridge’s surface. The dislodged abrasive then falls into a discharge pail. This automatic cleaning operation keeps air flowing uninterrupted and extends the life of the filter cartridges. The DC3100 pulls more than 1,000 SCFM of air, making it an excellent partner to either our automated systems or to multiple individual stations. A centralized dust collection system is far more effective than multiple small units in production environments that contain several blasters. The DC3100′s pleated cartridges provide a larger surface area than bag-style filters, allowing this rugged collector to trap more media more efficiently. The DC3100 is configured with just three cartridges, simplifying maintenance. We offer baghouse collectors, from 3/4 hp to 3 hp. Cloth style dust collectors are freestanding units that do not require special installation. Their compact design includes everything necessary for connection to the back of most Comco workstations. The filter design traps 99.9% of particles by volume. HEPA filtration is an available option on 1-3 hp units.